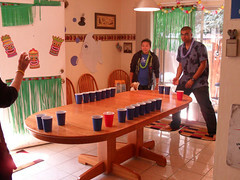 Here’s a interesting fun post from statehornet.com about the only college water pong club in existence. This is why Scandone included language in the clubâ€™s constitution discouraging members from involving themselves in alcohol drinking games, citing risk factors such as the heightened risk of transmitting the herpes simplex 1 virus. This virus causes cold sores, and cases have jumped 230 percent since 2007 in beer pong players aged 17 to 21. Yikes. Alrighty then. At this point, I think I’ll take the hangover. Obviously they need to up the alcohol content to kill the virus. While “Everclear Pong” doesn’t have the same ring as “Beer Pong,” 1) it also doesn’t leave a ring of cold sores, and 2) the games are a LOT shorter.